Who is this? Read on! The Clarence Brown Theatre this year took the theme for its annual fundraising gala from Truman Capote’s famous 1966 Black and White Ball held at the Plaza Hotel in New York City. This one, however, was held at the Jackson Terminal in downtown Knoxville. Folks here had no hesitation about throwing themselves into the spirit of the evening, many wearing masks, as the original guests did. Guest of honor was University of Tennessee alumna Paula Pell, a writer for “Saturday Night Live” for more than 20 years and an actress who has guest starred in television’s “30 Rock” and “Parks and Recreation.” She also wrote the 2015 hit movie, “Sisters,” starring Tina Fey and Amy Poehler. The Clarence Brown Theatre is part of the University of Tennessee’s renowned Department of Theatre, whose broad mission is to provide study for graduate and undergraduate students and to operate a professional theater to foster professional standards for the students to emulate and to provide a top-notch cultural experience for East Tennesseans. We are very lucky to have it in our community. Love this Truman Capote quote on the cocktail napkins! So, who was that masked man at the top of this post? Burke Pinnell of Hickory Construction! His wife, Leezah, also threw herself into the spirit of the evening. Cocktails on the porch launched the evening. I loved this swing, which was one of the auction items. Now, isn’t this a good idea? The servers had the name of their offering on their T-shirts. Thus avoiding the requirement that they answer the question, “What’s this?” all night long! Or, maybe you’d prefer some Coq au Vin? UT-Knoxville Chancellor Jimmy Cheek, left, with Dean Michael Wirth of the UT College of Communication & Information. Tonja and Tony Johnson. She is vice president of communications and marketing at the University of Tennessee. When it was time to move inside, we saw this stunning scene. Jeffrey Stanley, left, and David Byrd. David is managing director of the Clarence Brown Theatre. 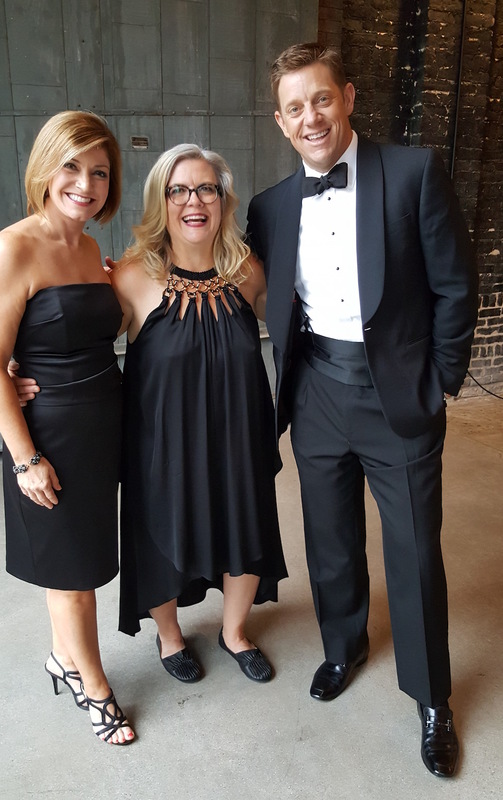 Masters of Ceremonies, Robin Wilhoit and John Becker of WBIR-TV, with honoree, Paula Pell, center. Sylvia Lacey, left, and Sherri Gardner Howell. Hahaha! Love this, Townes Osborn! Knoxville Symphony Executive Director Rachel Ford and her husband, Terry, with photobomber Cal MacLean, the artistic director of the Clarence Brown Theatre. Ha. Knoxville Museum of Art Executive Director David Butler, left, and Ted Smith. I love the way the arts leaders in Knoxville support one another. David Lauver with his friend Karen Clark. Images from the original Black and White Ball were projected on giant screens. Here’s Marilyn Monroe and Truman Capote. From left, Lee Radziwill, Mia Farrow and Frank Sinatra at the original ball. Alice Wirth, left, with her parents, Bernice and Obasi Onuoha. First course was an unusual strawberry soup. It was very sweet. I think I would have liked it had it been served in demitasse cups. “A little goes a long way,” agreed one of my tablemates. Ben’s parents, Leezah and Burke — without their masks! Susan Lauver with her son, Will. Fran Scheidt, left, and Georgiana Vines. John Gill and Margie Nichols, vice chancellor of communications and marketing for UT-Knoxville. John North and Sharon Lord. Jeffrey Pappas, director of UT’s school of music, and his wife, Joni. The entree was delicious, more than making up for the first course. Clarence Brown’s artistic director, Cal MacLean, and his sweet wife, Rebecca. Charlie Brakebill and Alice Torbett. From left, Kent and Susan Farris with Melanie and Tom Wood. Ilene and Chancellor Jimmy Cheek, left, with Jan Simek. Margie Nichols with Lee Riedinger, left, and John Zomchick. Angela Masini and Terry Grove. Brooks and Karen Clark. He’s chairman of Clarence Brown Theatre’s advisory board. Ice cream and cookies — one of Alan’s favorite desserts! Who catered the event? Looks yummy . . . .
Wayne: Everything except the cloyingly sweet soup was delicious. I believe Jackson Terminal has its own catering staff. Looks like fun–hate to have missed it. And I wouldn’t have needed to buy anything new to wear since I have a closet full of black & white–my favorite color combo. Many great dresses here–I think I like Karen Clark’s best. Here’s what I think Truman Capote was saying to Marilyn Monroe in that photo: “Don’t look at him! Dance with me! Gay: I also loved Karen’s dress! Alan: Poor Truman. That probably was what he was saying! Really enjoyed the photos which captured a wonderful event. I didn’t see all the masks that you did! Thanks, Georgiana. People tend to like to wear masks when they see me coming! Ha. But Alan’s was the cutest, wasn’t it? Wayne Christensen, All Occasion Catering catered the meal for this wonderful event. We had the help of the planning committee in selecting the menu and heard many wonderful compliments. The event venue at Jackson Terminal is part of All Occasion Catering.